In this lesson we teach the useful phrase “long time no see” in Thai and a couple more common phrases Thai people often use to talk about after haven’t seen each other for a while. “ไม่ได้เจอกันนาน /mâi-dâai jer gan naan/” is the phrase used for long time no see. Among women who are close friends it is acceptable and common to talk about the change in appearance such as weight, skin colour. In the video we explain how to use the word ขึ้น /kûen/ and ลง /long/ to form comparison. Pear is more beautiful than before. The rent is more expensive than before. He can speak Thai better. The rent is cheaper than before. “รึเปล่า /rúe-bplàao/” is a question word used when asking for a direct yes or no answer. It is similar to ไหม /măi/ or มั้ย /mái/, but it is just more direct. Answer ‘yes’ : repeating the phrase before the question word, or if you are talking to someone who is close to you or a person in the same age they might answer with just the sound อือ /ue/ or อืม /uem/ which is similar to English response ‘aha’. Miss Juk: คุณหิวรึเปล่าคะ /kun hǐu rúe-bplàao ká?/ Are you hungry or not? Mr. Ari: หิวครับ /hǐu kráp/ Yes, I am. Mr. Ari: ไม่หิวครับ /mâi hǐu kráp/ No, I am not. From the video I asked Pear อ้วนขึ้นรึเปล่า /ûan kûen rúe-bplàao/ which direct translation would be ‘are you fatter?’ or in English it would be ‘have you gain weight?’ . Bpen ngay baang is the contraction of bpen yangay baang? Kru Mod and Kru Pear, I love your role-playing. It’s both cute and instructive. It’s important to see the language in context, using words that haven’t been covered yet, and in realistic conversations. Well done! Can’t wait to see your next video. First of all I want to thank you for the interesting role-play and short video you shared. The video clips are so impressive – I could remember easier, faster and last longer. I have downloaded all the videos you composed and have them uploaded into my smartphone and thumb-drive in the car so that I could play the videos when I am travelling on business trip or driving. I have problem downloading the 190-words-e-book from your website after trying 3-4 times. Could you please send it to me? Thank you for your comment. I am happy to hear that you found my videos useful in your Thai learning. I have received many emails about the problem with downloading the eBook. I am trying to find help to fix it. Apologies for the inconvenience. I enjoyed the video. There is just so much one can cover in a 5 min video. It’s a nice quick dialog video. Thank you Kru Mod and Kru Pear. Could you two do a video on weather in the future? It could be useful in realistic Thai. We will improve the sound volume in the future. Thank you for your suggestion. I am with JR and Ken, learning a lot from your videos, writing down the full dialog and trying to learn from it. Like what you do so much. I have no understanding for anyone critisizing what you do, how you do it, etc. Your lessons are free, how can anyone dare? You missed saying what ‘rue-bplaao’ means. I tried to look it up but my app ClickThai just finds ‘rue’, saying ‘or’, it doesn’t know ‘blaao’. As for your question, I have added the explanation for this question word in the post already. Hi.Another interesting post from the two of you. But i think you are loosing the plot, you are not film stars. More content please. Brian: i think your comment was quite rude… and considering it’s free, i’d say be grateful for what you are getting. Kru Mod and Kru Pear, thank you so much for making the video. I thought you are doing great by encouraging the student viewers to focus on listening (as you said). You are preparing us to face the real world which does not provide captions. You provided the caption later on which was perfect. Please do not change it. 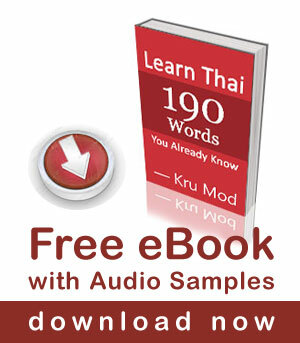 Khun Mod-I speak Thai OK and like your videos and knew everything in this one accept the one thing you didn’t explain! I’ve heard “ruu – bplao” in many contexts and I get the idea of what it means but would love a more detailed explanation.